Planets and Moons covers topics relating to the physics of the major planetary bodies in the solar system, starting with an introductory description of the solar system and collection of pertinent data, continuing with a discussion of the early history of the planets, and finishing with articles about planet dynamics, thermal evolution of planets and satellites, and descriptions of their magnetic fields and the processes that generate them. In addition to providing a review on the solid planets and the satellites, this volume addresses the interactions of solid surfaces and atmospheres as well as the roles of water and ice in shaping the surfaces of planetary bodies. Planetary geologists, astronomers, astrobiologists, and other researchers and students with an interest in the geology and physics of the solar system. 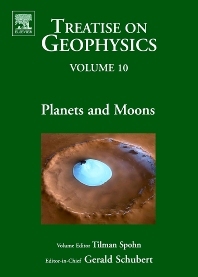 10.01 Overview, Pages 1-26, 10.02 Interior Structure, Composition, and Mineralogy of the Terrestrial Planets, 10.03 Planetary Seismology, 10.04 The Rotation of the Terrestrial Planets, 10.05 Gravity and Topography of the Terrestrial Planets, 10.06 Exogenic Dynamics, Cratering and Surface Ages, 10.07 Planetary Magnetism, 10.08 Planetary Dynamos, 10.09 Dynamics and Thermal History of the Terrestrial Planets, the Moon, and Io, 10.10 Solid Planet–Atmosphere Interactions, 10.11 Water on the Terrestrial Planets, 10.12 Geology, Life and Habitability, 10.13 Giant Planets, 10.14 The Origin of the Natural Satellites, 10.15 Interiors and Evolution of Icy Satellites, 10.16 Pluto, Charon, and the Kuiper Belt Objects, 10.17 Mission Analysis Issues for Planetary Exploration Missions, 10.18 Instrumentation for Planetary Exploration Missions. Tilman Spohn is director of the Institute of Planetary Research of the German Aerospace Center (DLR) in Berlin, Germany and Professor of Planetology at theWestfa¨lische Wilhelms-University Mu¨nster, Germany. He specializes in the Thermodynamics of Planetary Interiors and in physical problems of Astrobiology and has written 140 papers for scientific journals and books. He is a Principal Investigator (PI) for MUPUS on the Rosetta Lander Philae, for BELA on BepiColombo, and the instrument PI for HP3 on the InSight mission. Spohn has served as member and chairperson of ESA scientific working and advisory groups and is presently a member of ESA’s HISPAC. He is the chairman of the science committee of the international Space Science Institute and has served as editor for Earth and Planetary Science Letters, Reviews of Geophysics, and the Treatise on Geophysics. He is the recipient of the 2013 EGU Runcorn-Florensky Medal and a fellow of the American Geophysical Union.